As the world becomes increasingly interconnected, demand for air travel is growing, with more than 30,000 new large aircraft expected to take to the skies in the next few years. But if we are to sustain growth in air travel without aggravating global warming, we must quickly reduce aviation-related CO2 emissions, which are substantial and not covered by the Paris climate agreement that more than 190 countries agreed to last December. 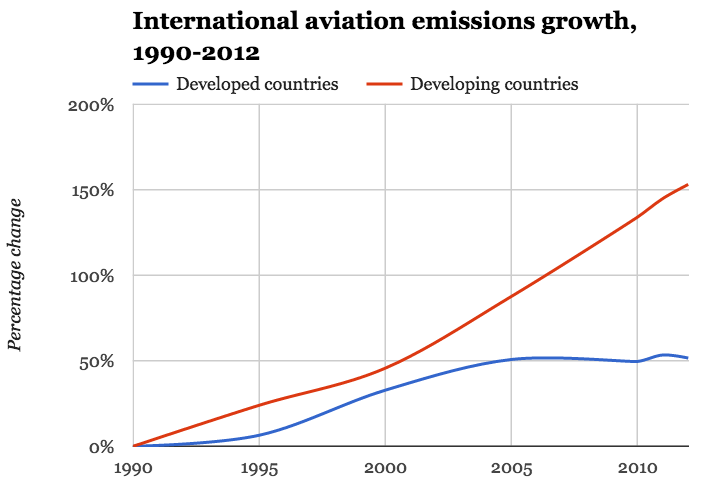 Fortunately, now is the perfect time to decouple aviation emissions from air-travel growth. Representatives from 191 countries convened in Montreal last week for the 39th Session of the United Nations’ International Civil Aviation Organization; after decades of wrangling, they have agreed to an aviation-specific climate agreement . The new ICAO framework aims for “carbon-neutral growth” in international aviation from 2020 onward, and has as its centerpiece a global market-based measure (GMBM) to help airlines affordably cap their net emissions at 2020 levels. When implemented, it will be the first carbon-emissions cap on a global industry that does not noticeably increase costs for consumers. And airlines will purchase emissions reductions from other economic sectors, thus funneling billions of dollars into low-carbon development around the world. For the first six years, the new framework will apply only to flights between countries that have voluntarily adopted it, which means that the ICAO will have to encourage adequate participation for the program to be effective. This opt-in approach has some critics, but whether a program is categorized as “voluntary” or “mandatory” is beside the point, because international accords generally apply only to the sovereign countries that have decided to join them. Some 64 countries have already signaled their willingness to sign on to the ICAO agreement, and together they account for nearly 80% of expected growth in CO2 emissions above 2020 levels. That isn’t 100%, but it’s a great start, and we can expect more countries to join when they see others reaping the benefits of low-carbon development. The airlines themselves will welcome a coherent global framework that establishes clear and predictable compliance metrics, rather than a regulatory patchwork that differs from country to country and complicates international operations. To minimize compliance costs – and because environmental sustainability is now a key competitive marker for customers and investors alike – airlines will likely encourage the countries where they do business to participate in the ICAO program. The new agreement provides an enormous opportunity to prevent the emission of 2.5 billion tons of CO2 in the first 15 years – the equivalent of taking roughly 35 million cars off the road every year the program is in force. The agreement will also spur major manufacturers such as Boeing, Airbus, Bombardier, and Embraer – which are already investing in quieter, more fuel-efficient aircraft and efficiency improvements for existing models – to develop cleaner technologies that will allow them to purchase fewer emissions offsets. However, the framework decided in Montreal is not complete, and crucial details need to be worked out quickly so that airlines can begin to plan how they will meet the new environmental targets. Developed countries have already offered to help implement the GMBM, which, it is hoped, will pave the way for investments in emerging economies that are becoming new aviation powerhouses. If the countries can leapfrog over old technologies, they can become new leaders in carbon-smart flying. They should seize the opportunity before them and join the ICAO framework so that their manufacturers have a clear and predictable path forward. At the Paris climate talks last year, we witnessed the power of global collective action to address climate change. No fewer than 187 countries – large and small, developed and developing – announced emissions-reduction targets in the months before the conference, which created the momentum to reach a landmark accord. With the Paris climate agreement on track to enter into force in the coming months – more rapidly than anyone ever thought possible – we still have that momentum. The ICAO agreement is the next wave in the international battle against climate change. Together, the two agreements will boost our chances of delivering environmentally sustainable economic growth. By cleaning up our carbon footprint now, future generations of air travelers from all countries will be able to look out their window onto a healthy planet.